﻿ Best Price on La Hamaca Hostel in San Pedro Sula + Reviews! 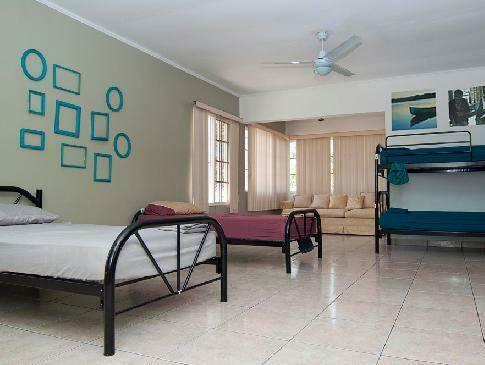 This comfortable hostel is located 1148 feet from San Pedro Sula’s City Mall. It offers a terrace with hammocks, free Wi-Fi zone and a gym, 6 minutes’ drive from the Bus Station. La Hamaca Hostel offers smart dormitory and private rooms, each with a fan. Bathrooms are shared or private with eco-friendly water saving toilets, and laundry facilities are available. The property has a large kitchen and 2 dining areas where you can prepare and eat meals. There is also an outdoor patio with BBQ, perfect for al fresco dining. La Hamaca has a movie room and a pool table. Tourist information is available and the Cusuco National Park is 5 minutes’ drive away. Yojoa Lake and Los Naranjos Eco-Park are both within 90 minutes’ drive. The property offers an airport shuttle for a fee and is 15 minutes’ drive from Ramón Villeda Morales International Airport. Please note that pick up transfers are available. Send us your info: Bus station: USD$5 for groups of 1-4. Airport: USD$15 for groups of 1-4.